The style of Berlin-based fashion label Boessert/Schorn is inspired by old manual techniques, traditional clothing, Bauhaus and Dadaism and is characterized by unique knits and the use of structured materials. These are combined with diverse patterns as well as complex and brilliant details. Designer Sonia Boessert creates the unique shapes by cuts from a rectangle that's molded freely and turned into a contemporary, comfortable design. 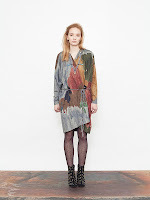 This is reflected in Boessert/Schorn's fall/winter 2013 collection that contains various materials next to a variety of colours and amazing prints.